Across the years, Kansas men’s basketball head coach Bill Self has fashioned an unmistakable brand of play. The Kansas Jayhawks, playing Villanova on Saturday in the Final Four, feature a high-low motion offense — inside-out basketball that moves the ball and values polished big men who can score at the rim and make decisions on the perimeter. That insistence didn’t leave much room for Kansas to adopt the ongoing 3-point revolution in basketball. Kansas stuck with its high-low system even as the very premises of the game were shifting underfoot. The lights flickered on briefly in that 2015-16 season, as observers wondered whether Kansas was finally adopting a modern rate of 3-point shooting. It didn’t last. Kansas’s rate of 3-point attempts fell off late in the season, and the team finished ranked 238th in the country in the share of its field goal attempts that were 3-pointers, according to KenPom.com. The Jayhawks were eliminated in the Elite Eight that season by a Villanova team that lived on the 3-point shot but didn’t shoot well in the quarterfinal. Self’s team took away Nova’s range, limiting it to 4 of 18 shooting from three, and the Wildcats won anyway. Perhaps this shook something loose in Self. In 2016-17, the Jayhawks threatened to be the first KU team under Self to breach the Division I average for 3-pointers attempted per field goal attempt. They weren’t a team of gunners, exactly, but their 35.9 percent 3-point attempt rate was a large step up for Kansas. This season, the Jayhawks have climbed even higher, reaching 41.4 percent — easily clearing the D-I average of 37.5 percent. That’s a quantum leap for the program given its recent history and a shocking development given Self’s stated opinions on shot selection. Why the team had to change this season isn’t much of a mystery. The high-low offense frequently puts the key decisions of a possession in the hands of the team’s big men, either after receiving a pass at the top of the key (the “sweet spot” that allows a player to shoot, pass or get back on defense) or down in the low post. This allows the offense to get its big men open through screens and ball reversals and for the bigs to find cutters for easy buckets. It requires bigs who can execute a moving, developing offense. But the Jayhawks’ frontcourt exploded just before the season, leaving the team without that crucial component. That left Kansas with sophomores Udoka Azubuike and Mitch Lightfoot, as well as late-arriving freshman Silvio De Sousa. Azubuike has been excellent — his 77.2 field goal percentage is the best in Kansas history — and De Sousa has emerged as a reliable backup. But this is not the polished frontcourt of your standard contending Kansas team. So Self has empowered his perimeter players to carry the team instead. Devonte’ Graham, Malik Newman and Sviatoslav Mykhailiuk each are shooting more than five threes per game this season and hitting better than 40 percent. LaGerald Vick is shooting four per game and making 37.8 percent. By contrast, party-crashing Loyola of Chicago takes only 35.8 percent of its shots from three, below the average — though still above Self’s preferred waypoint. That’s unusual for an upset-minded team — those teams often take advantage of the short college 3-point line to achieve short-term scoring parity. Loyola instead relies on skill and strategy to win, along with new inefficiencies in the modern game ripe to be exploited by the right team. 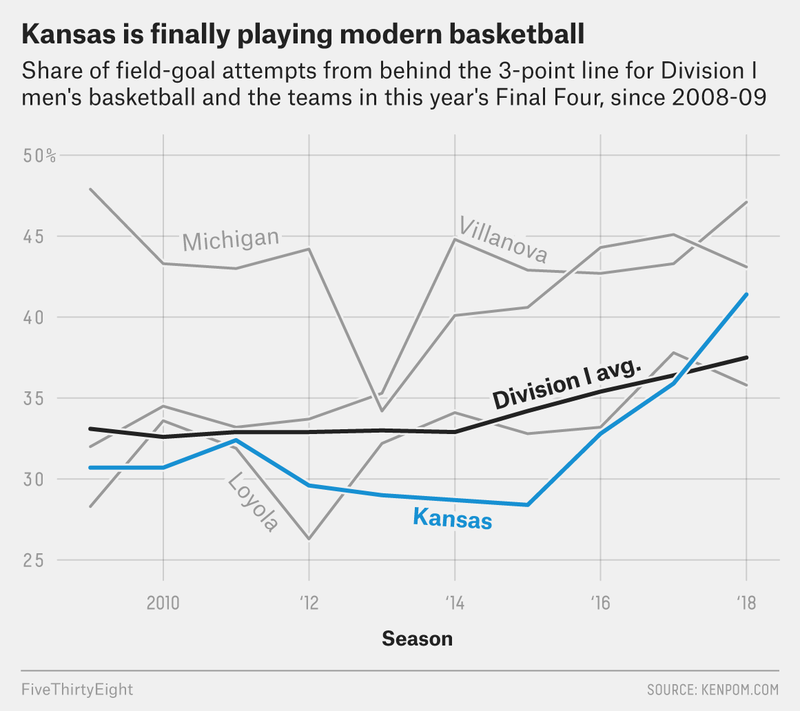 While Kansas does not attempt threes at quite the same rate as Villanova or Michigan, it has gotten off a similar number of attempts thanks to another modern facet of the squad: Kansas plays at a relatively fast tempo, while the other three semifinalists play at a glacial pace. Despite taking an enormous 47.1 percent of their shots from beyond the arc, Villanova has not pushed tempo: The Wildcats rank 225th in the country in average length of offensive possession, at 17.8 seconds, according to KenPom.com. Michigan ranks 311th at 18.7 seconds. And Loyola comes in 285th at 18.4. It makes sense for Loyola to slow pace, since underdog teams are best served by minimizing possessions and leaning on variance to carry them over more talented opponents. But a team like Villanova, more talented than nearly all of its opponents, would be better off maximizing the number of shots taken by both its own players and its opponents. Talent wins out over time. Kansas has maintained a standard brisk tempo over the past several seasons, ranking in the top 100 and often the top 50 in the nation since 2013 by KenPom.com’s average offensive possession length. (The Jayhawks rank lower on overall tempo because their defense typically forces opponents late into the shot clock, which is a good thing for a defense to do.) This season, Kansas is at 16.5 seconds per offensive possession, 76th in the country and miles ahead of its Final Four competition, making it the only program remaining that’s playing by the modern guidelines for overdogs: Push pace and shoot threes. This seems to be the season that Bill Self finally, fully, adapted to his players — and the times and, OK, the catastrophe surrounding his preseason frontcourt. This concession has allowed the Jayhawks to reach the Final Four, playing Saturday in what sure seems like the de facto championship game. Villanova will be the favorite. But Kansas, for once, will not have its own ideologies holding it back.